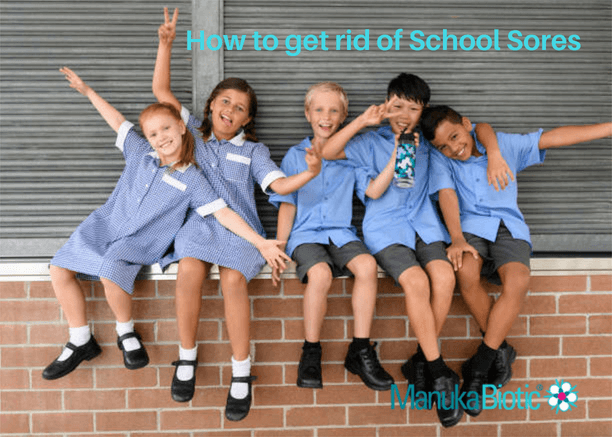 Home/impetigo, Manuka Oil, Natural Treatments, School Sores, Skin, Skincare, Staphylococcus aureus, Uncategorized/What are School Sores? Natural Treatment Alternatives that work. School Sores ‘Impetigo’ is a common harmless infection of the skin caused by either Staphylococcus aureus better known as “golden staph” which is a bacteria that commonly live on the skin, lurking in the groin and nostrils without causing problems but if untreated it can cause a serious infection. Or Streptococcus pyogenes, commonly known as “strep”. Streptococcus pyogenes can cause other infections such as tonsillitis and pharyngitis. In fact, it is often the “strep” responsible for “strep throat” bacteria. School sores are a contagious blister like sore (can be caught from another person by direct contact). The bacteria can affect skin that is intact (known as primary impetigo) or skin that is already compromised with cuts, abrasions, insect bites and is not uncommon for those suffering from other skin conditions such as eczema to catch school sores (known as secondary impetigo or impetiginisation). It is common for children and young adults but can occur at any age. Staph is found on the skin and in the nose of 30–50 per cent of people without causing disease. It will only cause an infection when it can enter through a wound or open skin. A staph infection normally only develops in the elderly, the very sick or those who have an open wound. Healthy people rarely become infected. Staph can only be spread by skin-to-skin contact. You cannot catch it just by being in the same room as an infected person. Good hand hygiene can prevent the spread of staph. School Sores infection is commonly transmitted to other children in the family. Several medical studies indicate that children prone to atopic dermatitis and eczema have been prone to school sores. Staph generally causes no problems or illness. However, if the bacteria enters the body through a wound, cut or graze, or open skin (e.g. broken skin caused by eczema), it may cause an infection. Staph is one of the most common causes of skin infections and can cause serious wound infections. In most people (about 70%), the rash starts with a red area which develops into small blisters “bullous impetigo” filled with clear fluid or pus. The sores begin as red areas, or crops of small blisters, most commonly around the nose and mouth, and on the arms and legs. The sores then burst and begin to weep, before drying with a golden yellow, honey-coloured scab, often referred to as a “non-bullous impetigo”. School sores blisters appear on the skin one to three days after being infected by staph, or four to ten days after catching strep. 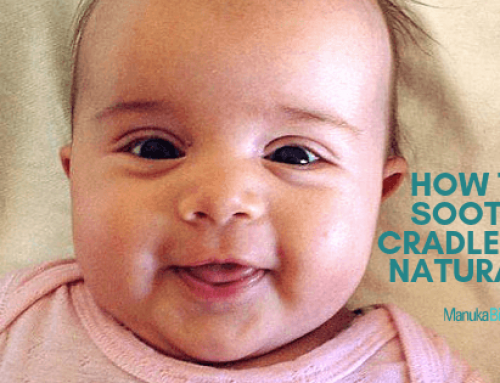 It can occur on sores from scratches, insect bites and eczema, or on healthy skin. Commonly they can appear around the arms and legs, and if the school sores are around the nose and mouth area these are caused by a strep infection of the nose. This process usually takes about a week. People who are immune suppressed may have more lesions and these may take longer to clear up. How To Prevent School Sores Spreading? Every time your child touches the school sore and then scratches another part of the skin with that finger, they can start a new site of school sore. To prevent this, encourage your child not to touch or pick at the sores. Keep their fingernails cut short, so the bacteria can’t live under their nails and spread. Wash their hands often with one of the antibacterial liquid soaps. Cover the sores with a Band-Aid if they are not on the face. If only a small crop of sores is present, frequent washing with antibacterial body wash and water might be all that is needed. A prescription antibiotic ointment can also be used. If the sores are more widespread, or there is evidence of infection spreading into the deeper skin (cellulitis), oral antibiotics are often necessary. Because school sores spread by skin-to-skin contact with an infected sore, there often are small outbreaks within a family or a daycare centre. Avoid touching objects that someone with school sores has used, such as towels, sheets, clothing and toys. If you have recurrent outbreaks of school sores this is usually due to long-term carriage of the bacteria organism living in places that the antibiotics cannot reach. This includes the nasal passage, the fingernails and under the arms. Treating these areas is important, and your doctor can assist you in recommending antibiotic ointment for the nasal passage or other areas. Sometimes it is necessary to treat the whole family. Can School Sores Be Cured? Yes. If your child develops the sores, the following measures can reduce the spread of infection, especially during the infectious stage, when the impetigo lesions are oozing or crusting over: Your family’s overall hygiene needs to be controlled by washing your hands often. Change pillows and clothes more frequently and bath towels daily. Don’t use soap bars, use liquid soap or antibacterial body washes instead. Don’t scratch bumps and cover any pus head school sore lesion with adhesive bandage or clothing. Don’t share towels, toys, clothing or baths. Manuka Oil: Manuka Oil (scientifically known as Leptospermum Scoparium, if you’re in the mood for technical lingo) is indigenous to New Zealand. It is highly antibacterial, anti-fungal, and anti-viral making it extremely effective and beneficial against harmful bacteria that live on the skin‘s surface. It is a saviour for bacterial infections of the skin caused by either Staphylococcus or Streptococcus bacteria such as School Sores. Add 3- 5 drops of Manuka Oil to a bath can help clear the skin of harmful bacteria. 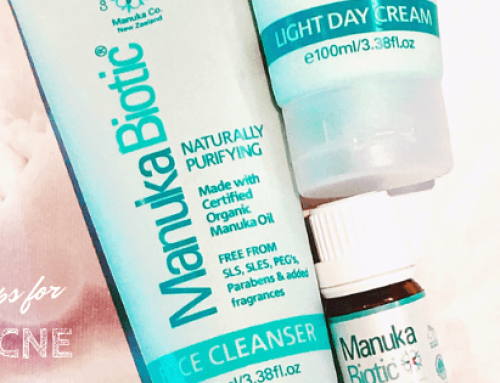 Manuka Biotic Manuka Oil is sustainably harvested from the leaves of Manuka trees, extracting the oil through steam distillation on our farm in the Coromandel, New Zealand. Our Manuka Oil is the only certified organic Manuka Oil in the world. Manuka Oil is for external use only. Manuka Biotic® BodyWash: Containing Manuka Oil our Body Wash is antibacterial and anti-inflammatory and can help reduce the bacteria on the skin and help contain the school sore virus. Apple Cider Vinegar: This treatment is more harsh and aggressive, and while it sometimes leads to positive results, often comes along with some amount of skin irritation. Dab pure apple cider vinegar on the sores to fight the bacteria and ease the inflammation. The apple cider vinegar’s acidity kills the bacteria and helps eliminate the sores. We recommend that if you do use an apple cider vinegar wash over the infected skin daily, that after you dry off, to apply the Manuka Biotic® Body Lotion, which will help to soothe the skin and provide an antibacterial cover to the skin. Tea Tree Oil: For treating a wide variety of skin conditions, including eczema, psoriasis, ringworm, molluscum contagiosum and school sores, tea tree oil is a trusted, side-effect-free solution that can be directly rubbed on the affected school sores. Use a cotton ball, as with the apple cider vinegar approach, and dab the bumps 3-4 times per day. Tea tree oil according to a February 2003 review in “Journal of Antimicrobial Chemotherapy,” tea tree ointment demonstrated “positive results” against impetigo (school sores) in one clinical trial. It has also been proven effective for treating acne and for Staphylococcus Aureus (MRSA) and Streptococcus bacteria infections. The type of treatment will depend on the type of impetigo and the severity of symptoms If treated correctly from the first blister to the skin being sealed and repaired will take a week depending on the severity of the outbreak. Remember, school sores is not harmful, just unsightly. So keep working on the twice-daily application of a little Manuka oil and Body Lotion and spread it over the spots. It does not need to be rubbed into the skin. Once the body starts attacking the staph infection you might see redness, some swelling, crusting and maybe even drainage of the sore area. This is can be your you little ones complain that their sores are itchier, or the sore might surge with soreness and become the area becomes hot and inflamed as the bacteria is under attack. The application of a small cold ice pack to the sore (still covered by a bandaid) can help to soothe and reduce the inflammation to the area. A surge is not likely to last more than 5 mins to 10 mins. Most children will be able to be distracted by an ice cream of their own in the meantime. Definitely, talk with your doctor if there is any concern or your children is feverish or lethargic, and sores are spreading despite the use of antibiotics (if prescribed). One possible reason for sores not improving on standard antibiotics is infection by an antibiotic-resistant bacteria. Infections due to antibiotic-resistant golden staph, MRSA (methicillin-resistant Staphylococcus aureus), are becoming more widespread, largely due to the widespread use of antibiotics. 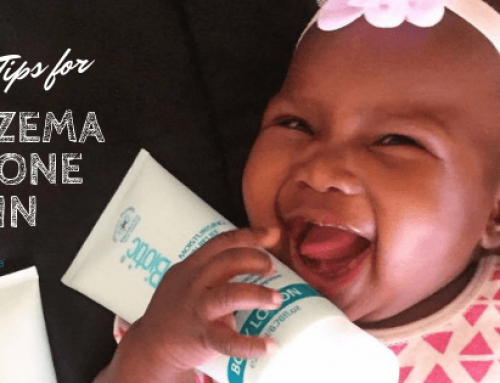 We don’t recommend using any pure Manuka Oil or Tea Tree essential oil on children under the age of 4 years old, without adding to a carrier oil, such as coconut oil, or jojoba oil as it can cause irritation or an allergic reaction. We always recommend that you test a small, unaffected area of skin with the oil, and if there is no reaction within 24 hours, it should be safe to use. You can read how to do this test here. Another big, big part of recovering from the school sores is getting your little one’s immune system as strong as possible. The body will recognise and combat the infection, but not if it’s already busy fighting the flu or colds – so start getting your little one (or yourself) as healthy as possible. Keep your child’s fingernail short to avoid the spread further of staph bacteria. Following these steps can help prevent the spread of school sores. A tip for keeping toys and play area clean is to mix up some apple cider vinegar and Manuka oil into a spray bottle and spritz this over the toys and play area. You can use the same combination above with hot water to mop your floors. Kids are generally ready to go back to school once they’ve had 24 hours of antibiotics and if the school sores are covered with dressings. For children not taking antibiotics, public health authorities recommend that children only return to school when the sores are completely healed. If you have recurrent outbreaks of school sores this is usually due to long-term carriage of the bacteria organism living in places that the antibiotics cannot reach. This includes the nasal passage, the fingernails and under the arms. Treating these areas is important, and your doctor can assist you in taking a nose swab to test for bacteria and recommending antibiotic ointment for the nasal passage or other areas. Sometimes it is necessary to treat the whole family. Many people have dealt with school sores and found ways to manage the stress that comes with it. Consider joining our Facebook page, to connect with other Mum’s people who are going through this with you. 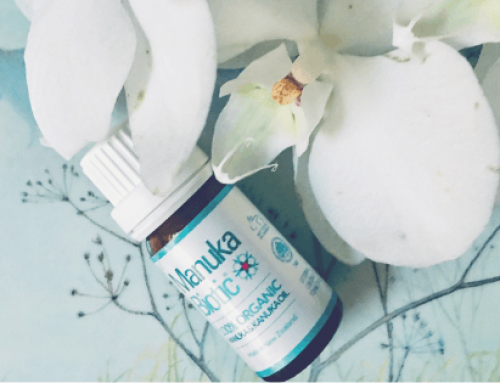 We have many Manuka Mum’s who have shared their story online for those struggling with stress and anxiety from school sores, as well as many other itchy skin conditions. Do not be afraid to reach out – we love to hear from our Manuka Mum’s community, and we understand what you are going through. DermNet New Zealand – All about the skin – This organisation has an excellent website. A full list of skin condition facts, forums, blogs, education and a support line, to help improve the lives of people living with itchy skin conditions.